On Wednesday evening, I attended the first of a series of events I’m participating in as part of the Unusual Suspects Festival 2017. 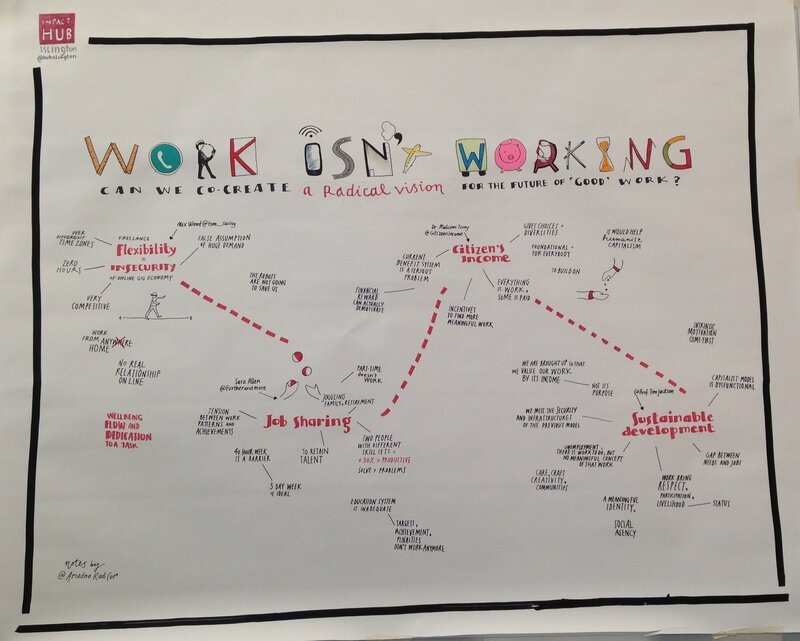 The question for the evening was “Work isn’t working- can we co-create a radical vision for the future of work?”. The subject of how a scenario where everyone has the opportunity to find “work that works” for them has been of great and growing interest for me since, five and a half years ago (and several months thinking about it prior to that), I took the decision to step out of full time, permanent work. There is much more I could write about my motivations for doing so, what I have learned along the way and why I am still pursuing this work structure, but that’s for another post (or several). At the session, we were initially challenged to think about what our own “radical vision” might be. For me, this recalled a question I’ve been pondering “What if all work were flexible by default?”. What I mean by this is rather than the most common (although evolving situation) where role design starts from a premise of 9-5, five days a week, and some elements of flexibility are “retrofitted”, what if this was turned on its head? In that case, roles would be designed with the key needs in mind, and then any “must have” practical constraints would be added in (eg I need someone to be able to open the office building by 8am on a Monday) and opened up to the applicants to propose how they could make this work. This might be through applying with job share partners, working compressed hours, working at weekends and having a couple of weekdays off etc. Clearly this is not a quick win, but I know examples such as Happy and the case studies in Frederic Laloux’s must-read “Reinventing Organisations” that are successfully takings similar approaches. The evening continued with a panel, offering the varied perspectives of Adam Wood who spoke about his research into the online “gig economy”; Sara Allen of Further and More on the benefits of job-shares; Dr Malcolm Torry of Citizen’s Income Trust on the potential for a Universal Basic Income; and Professor Tim Jackson on reframing work as the provision of a service to each other and the importance of work in its broadest sense in giving a sense of respect and identity. the fine balance between maintaining an incentive to participate and contribute to society whist minimising bureaucracy in the case of a Citizen’s Basic Income as well as the opportunity to learn from the immense amount of research and case studies on this topic. The discussion was focused very much on structures, flexibility and reward, but how can we reshape work to enable those who are currently excluded due, for example to disability or long term physical or mental health conditions, to find meaningful opportunities that accommodate their needs? I love the concept of a shift towards co-operative and social enterprise models, but what might this mean for our tax system and the way public services are funded? Also within this model, what are the implications (which could include some exciting opportunities) for the way we commission, conduct and fund research and learning and development activities? How can we distribute the “nasty and boring stuff” more widely (unless it’s removed via automation) so that there are few or no jobs that only consist of this type of task? In a World where we were “freed” to be more self-directed in our work, what does this mean for those who lack the motivation, skills and most importantly confidence to assert themselves and seek opportunities? And what would the role of “employer” be, given that it is currently not purely about restriction and control but also employee welfare, stability and skills development? I’d love to hear other views on the issues above and ideas/ examples of how we can continue and broaden this discussion so that the pathways and forums for change can be better defined and more relevant to the widest possible population – please share!